The halls were empty when Trixie returned to her locker. She dialed the lock combination and opened the door. Much to her relief, everything stayed in place. She quickly began pulling out gym equipment, textbooks, notebooks, and other odds and ends, attempting to give the whole mess some semblance of order. She was working busily, when suddenly she became aware of voices nearby. "I don't know how Di Lynch got that part." "Now, Jane, everyone can't have the lead. Besides, you're on the costume crew." "So what? I should be playing Juliet. I took drama lessons all through elementary school," the one called Jane replied. "That whole gang makes me sick, Patty. Honey's so rich, and Trixie thinks she's such a smart detective. I think she's just plain nosy." "That's not fair, Jane. She's done a lot of good. Remember, she got Hoppy back for the town hall." Trixie froze. She wasn't sure whether or not to step out from behind the concealment of her locker door, but she decided to stay put. 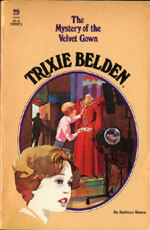 When she heard the two girls turn and go down the side corridor, Trixie strained to hear the rest of their conversation. "I suppose that's true," she heard Jane say, "but the police could have done the same thing, and that's their job, not Trixie Belden's." Tears stung Trixie's eyes. She recognised the voices as those of Jane Morgan and Patty Morris, two classmates. She had never imagined that anyone felt that way. Then suddenly, her hurt turned to anger as Jane concluded, "Whatever the case, Patty, I'm going to make Diana Lynch sorry she ever tried out for the part of Juliet." The Bob-Whites are excited when Di wins the part of Juliet in the school play which is to be directed by their new drama teacher, Eileen Darcy. The cast are thrilled when she organises for some rare costumes to be loaned to them for the school play, but Trixie soon suspects that something is not quite right with the young drama teacher and her handsome fiancé. Trixie learns that Miss Darcy's father has been kidnapped and Honey has a feeling she's seen her fiancé somewhere before, while Miss Darcy becomes quite protective of the costumes and is acting very strangely. 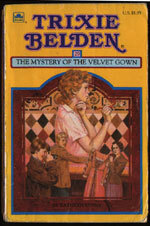 Trixie and Honey try to investigate the pair while trying to protect Di from a jealous classmate and solve the mystery of the Velvet Gown. Peter Ashbury - he was a jewel thief who kidnapped Miss Darcy's father and blackmailed her into removing the jewels from the costumes. He was also married and had two children and was suspected of fraud. The book commences on the third of January and the play is to take place in six weeks, opening on Valentine's Day. Paul Victors is cast as Tybalt, John Munter as Mercutio, Jamie Kenworthy as Romeo and Di Lynch as Juliet (p. 18). Dan does not appear in this book. He was away at a two week seminar in New York City about neighbourhood youth programs (p. 26). Trixie and Honey visit the city later in the book, but no mention is made of Dan, and if the city is only an hour train ride away (p. 138) why doesn't Dan commute daily, or at least come home on the weekend? Miss Trask was a friend of Miss Darcy's mother, who died when Miss Darcy was a child. Miss Darcy moved to London with her father, who was an assistant to the ambassador and she decided to visit New York six months ago. Drama teaching jobs were hard to find in London, so when there was an opening at Sleepyside High, she decided to take it (p. 26). Honey visits Crabapple Farm and rings the back doorbell! (p. 37) Since when do the Beldens have a back door bell? The school newspaper is called the Campus Clarion (p. 118) but when Trixie talks to Bill Morgan, he mentions the Gazette (p. 121). The town newspaper is The Sleepyside Sun, so does the school have more than one paper? Miss Trask's sister is in a wheelchair (p. 137), but at least now she is out of hospital, as she was in #12 The Mystery of the Blinking Eye. The Bob-Whites go riding but Trixie rides Lady, Honey rides Strawberry and Mart rides Susie (p. 177). Only Brian and Jim ride their usual horses, Starlight and Jupiter.